The choir was a fantastic source of support during my husband’s tour; I missed the singing but I missed the friendship of the other wives more. Upavon is a small, isolated camp and the more I thought about setting up a choir, the more I felt it would be a really positive thing for families living here. By posting on our camp’s Facebook page, I was delighted to find there was some interest. From our first meeting, the enthusiasm for singing and friendship was infectious. After receiving support from the Military Wives Choir Foundation, we got permission from the station commander, secured a rehearsal venue and advertised our first session – cakes were a big incentive! We recruited a musical director who was a fellow wife living on camp; we just had to hope that people turned up. 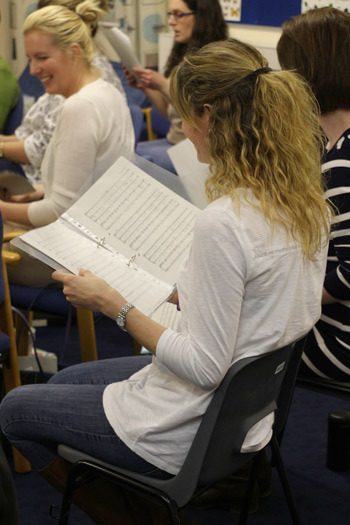 25 ladies came along, which was fantastic, and by the end we were already singing a gospel medley in a round! It was wonderful to hear the sound we could make but more important to bring women in the military community together. We have members from Upavon and Netheravon, a daughter of a retired soldier and a current serving soldier. We’ve received fantastic support from other choirs and look forward to carrying on singing and making friends. As the title of the Military Wives Choir album says, we are “stronger together”. access to all our documents.